The second day of the Argentine WorldSBK round was staged today on the new El Villicum track, near San Juan. Maximilian Scheib ends up 13th on his debut race in WorldSBK with the F4 RC, while De Rosa and Badovini place respectively 11th and 13th, with De Rosa involved in a crash during his fast lap. 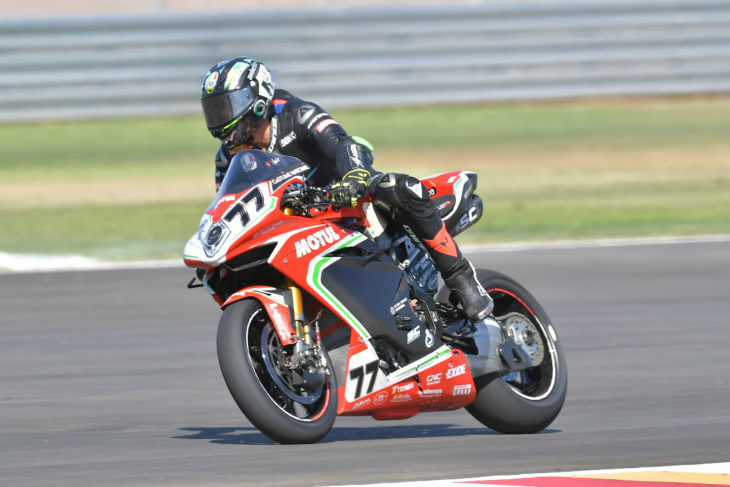 Maximilian Scheib has today faced his debut WorldSBK race with the Italia four-cylinder machine, with only one day of testing behind to get familiar with the new bike and the new circuit. The young Chilean rider kicked off Race 1 from the 16th place on the starting grid and started fighting into the top 15 for all the 21-lap long race, ending up 13th under the checkered flag. At the end of the last qualifying day, Raffaele De Rosa and Ayrton Badovini collect results below their expectations, with De Rosa qualifying 11th in the SP2 due to a crash occurred on his fast lap, only 2 minutes from the end of the session. Started from SP1, Badovini didn’t make it into the next qualifying heats for just one position, finishing with the 13th time in the overall timesheet. Maximilian Scheib – Session after session I keep improving the feeling with the bike, also thanks to my team’s great job. All in all, the race was good and allowed us to collect important data to be analyzed ahead of Race2. I wish to say thank to Andrea Quadranti and MV Agusta for giving me the opportunity to get involved in this new adventure. Raffaele De Rosa – I’m really disappointed because I know I had the chance to aim for a much better position. Unfortunately, this crash will force us to ride a comeback race but I am confident that with a good rhythm we will be able to get close to the podium area. Ayrton Badovini – I’m sorry I missed the SP2 for only a few thousandths, but I’m very happy with the step forward we have made compared to yesterday. During the Superpole we have solved several problems that we met in the previous sessions and I am confident tomorrow we will be able to make a good race.